We know you care about your children’s teeth and want to make sure they have a good experience with the dentist. In fact, that’s what we want, too! Positive dental experiences can help ensure your child embraces a lifetime of good oral health habits. Let’s have a look at some of the top questions many of our patients have about our pediatric dentist services. Pediatric dentistry focuses on children from young toddlers into their late teens and early adulthood. The American Academy of Pediatric Dentistry recommends your child see a pediatric dentist when their first tooth appears and certainly by their first birthday. 2. How important are baby teeth? Your child’s baby teeth are very important. They help as your child graduates to chewing solid foods and supports good nutrition, they aid your child as he or she learns to speak clearly, and they pave the way for the permanent teeth that will follow. 3. How often should my child visit the pediatric dentist? Just like adults, children should have a dental checkup every six months for a cleaning to prevent cavities. In early childhood, these regular visits also help to make your child feel comfortable about visiting the dentist and start good oral hygiene habits. 4. When should we start using toothpaste? As soon as the first tooth arrives, it’s time to introduce toothpaste. Just a small smear of toothpaste is sufficient for children under two years old. From 2-5 years old, a pea-sized amount of toothpaste can be used. Follow the instructions, be sure your child doesn’t swallow excess toothpaste, and use a soft child-sized toothbrush. Again, in the beginning, it’s all about the learning and practice of cleaning the teeth for children. 5. How can I help my child avoid tooth decay? For very young children, use only breast milk or formula in a baby bottle, never juice or any sweetened drinks. If a child goes to bed with a bottle, be sure it only contains water. As children sleep, saliva is reduced, and its self-cleaning action is lessened. Help your child to drink from a cup by their first birthday and never dip a pacifier in sugar or honey. Just like your own dental care, healthy snacks, and limited sweets are important for good health. 6. Should I consider sealants for my child’s teeth? Dental sealants are a great, easy, and safe way to help children stay cavity-free. They are painless and quick to apply, and provide a clear coat onto the surface of teeth that can be hard to clean. Best of all, sealants can protect a child’s teeth for years. 7. How can I ensure my child gets enough fluoride? Fluoride is an important part of dental health care. The primary source of an appropriate level of fluoride is drinking water. For many health reasons, it’s important that you and your child make a regular habit of choosing drinking water over sodas or other drinks. Regular use of fluoride toothpaste also provides adequate coverage and protection for the surface of teeth. 8. What kind of protection should my child use during sports? It’s great for kids to become active and want to participate in organized sports. You will want to consider a soft, plastic mouthguard to protect your child’s teeth, cheeks, and gums. Custom-fitted mouthguards provide good protection as they are purpose-made for your child’s individual mouth and bite. 9. Should I be concerned about dental X-rays? New, digital X-ray technology is now in use in progressive pediatric and family dentistry practices. This technology not only provides excellent detail for your dentist to understand and identify any problems with the mouth or teeth, but the process is now quicker and exposes patients to up 85% less radiation than traditional film X-ray technology. You should not have a concern about utilizing this great diagnostic asset in you, or your child’s, dental care. 10. 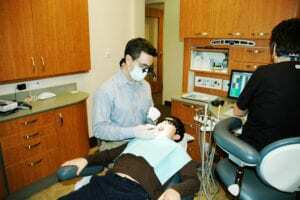 What should I look for in a pediatric dentist? Pediatric dentists have received additional professional training for babies, children, teenagers, and children with special needs. First and foremost, make sure your dentist is a qualified pediatric dentist that can provide this expert-level of care. Dental practices that are family friendly and offer a comforting environment are important to put your child – and you – at ease. Finally, a pediatric dentist who will explain the process of a dental visit and what procedures to expect help to ensure your child has a positive experience, one that they will want to repeat. North Boulder Dental Group offers professional, qualified pediatric dental care and we’re here to answer any other questions you might have. If you are looking for a dentist for yourself and your family, we’re confident you will be pleased with your experience at our practice. Learn more about our family of dentists or contact us to set up an appointment for you or your child.